With the Super Bowl coming up on Sunday, plenty of websites are offering tips and tricks for football-themed recipes (basically, you just form regular food into a football shape). 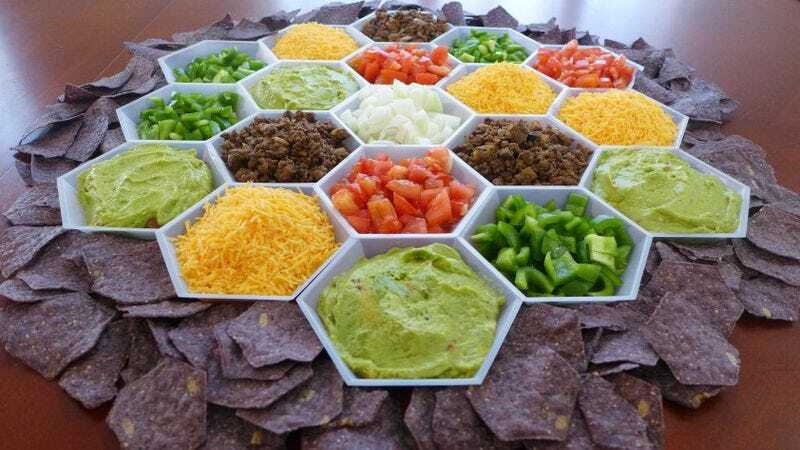 But for those nerds more interested in a game night than a sports night, Kitchen Overlord—a geeky cooking-themed website—suggests these Settlers Of Catan-inspired nachos. So next time you sit down to play the popular cult board game that’s always a little longer and a little more boring than you remember it being, at least you’ll be well fed. Because the nachos don’t contain brick, wood, or ore, the only thing that really makes them Catan-themed is their presentation. Kitchen Overlord recommends serving the nacho components in hexagon bowls (like these plastic ones designed for science labs) alongside blue hexagon chips that replicate the “ocean” on the Catan board. The added benefit of these de-constructed nachos is that each guest can make their own plate, which makes it easy to accommodate allergies and dietary preferences. The idea comes from Chris-Rachael Oseland’s upcoming Wood For Sheep: The Unauthorized Settlers Cookbook. Kitchen Overlord is previewing other deconstructed recipes from the book, including breakfast bars, Mediterranean-themed nibbles, and a meatloaf dinner. It seems basically anything can become Catan-themed by cutting it into a hexagon, like this caprese salad. And if all else fails, just serve some mutton and remind players why sheep are truly the most invaluable resource on the board.